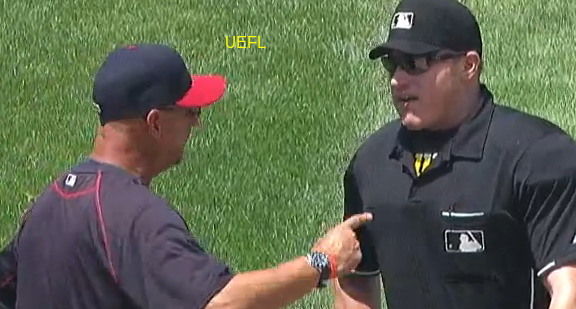 HP Umpire Tom Woodring ejected Indians Manager Terry Francona for arguing an ejection no-call (Unsportsmanlike-NEC) in the bottom of the 5th inning of the Royals-Indians game. With one out and none on, Indians batter Michael Brantley took a 0-1 fastball from Royals pitcher Jeremy Guthrie for a hit-by-pitch. Replays indicate the pitch was located inside and hit Brantley's calf; warnings had previously been issued after two previous hit batsmen, the call was irrecusable. At the time of the ejection, the Indians were leading, 2-0. The Indians ultimately won the contest, 12-1. This is Tom Woodring (75)'s first ejection of 2015. Tom Woodring now has 1 point in the UEFL Standings (-2 Previous + 3 AAA + 0 Irrecusable = 1). Crew Chief Gary Cederstrom now has 7 points in Crew Division (6 Previous + 1 Irrecusable Call = 7). This is the 139 ejection of the 2015 MLB Regular Season. This is the 63rd Manager ejection of 2015. This is the Indians' 5th ejection of 2015, T-3rd in the AL Central (KC 10; CLE, CWS, DET 5; MIN 3). This is Terry Francona's 3rd ejection of 2015, 1st since June 28 (Ron Kulpa; QOC = Y [Balls/Strikes]). This is Tom Woodring's first ejection since March 23, 2015 (Glenn Sherlock; QOC = U [Throwing At]).